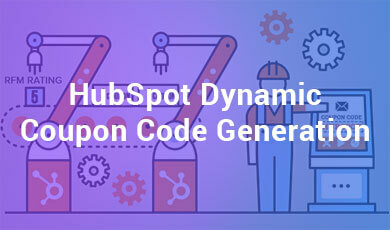 HubSpot Dynamic Coupon Code Generation helps to generate single-use coupon code which you can send to your customers. 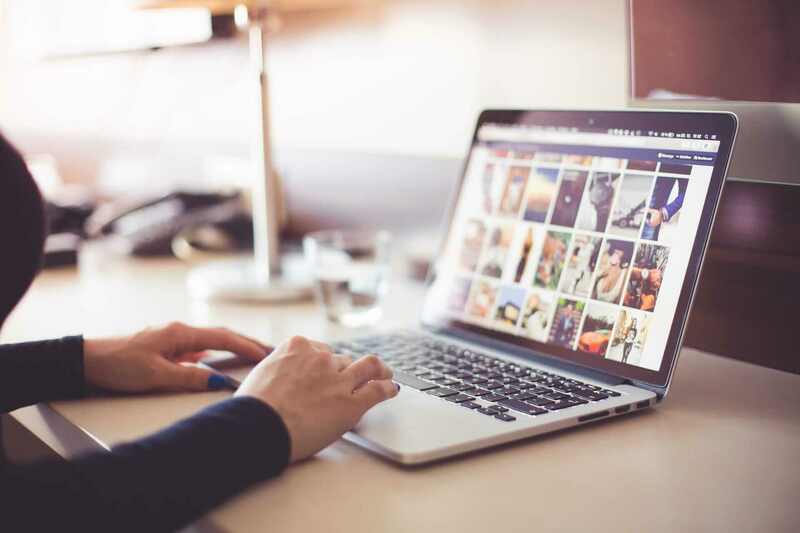 This is a powerful tool for the auto-generation of WooCommerce coupon codes for your existing customers based on their current HubSpot RFM rating. The fields and properties values can be used in HubSpot email workflows for better customer-merchant relationships. It helps to generate dynamic coupons for store customers based on their current RFM rating over HubSpot. Automatically updates the generated coupons details over HubSpot to the contact properties. Track all the generated coupons for the HubSpot customers. Rewarding the loyal and best customers of your store and magnate more customers for future through HubSpot Dynamic Coupon Code Generation has become easier now.  Note: To use the HubSpot Dynamic Coupon Code Generation, first you need to install and activate HubSpot WooCommerce Integration PRO or HubSpot WooCommerce Integration by Makewebbetter (free version of wordpress.org). 1. Download the zip folder of the plugin HubSpot Dynamic Coupon Code Generation. Manual installation of the plugin is another option to install the plugin to your WordPress-environment. The manual installation method involves downloading our HubSpot Dynamic Coupon Code Generation extension and uploading it to your web server via your favorite FTP application. 1. Upload the HubSpot Dynamic Coupon Code Generation folder to the /wp-content/plugins/ directory. 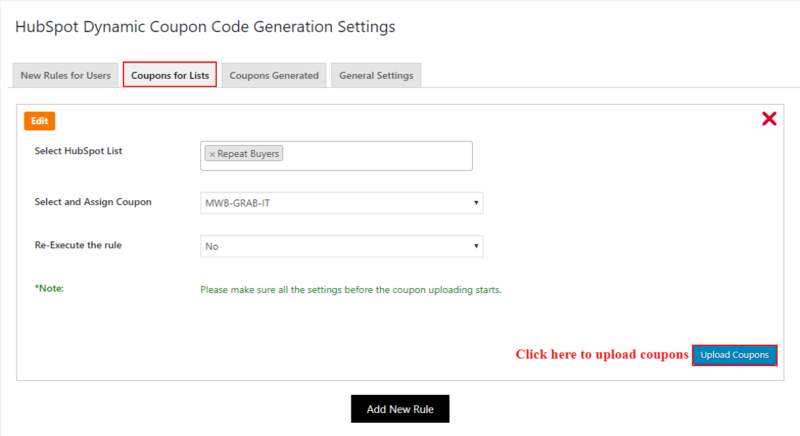 Click on the Add New Rules for adding new rules for coupons generation. The administrator can specify all the conditions for the coupon generation mainly the RFM rating and other conditions like a coupon code, expiry date etc. and click on the save changes for saving the settings. The administrator can add multiple sets of rules and delete the existing set of rules defined for HubSpot Dynamic Coupon code. The administrator can specify the RFM rating for which he wants the coupon to be generated. Whenever the store’s customers data will get updated over HubSpot, then the coupon will be automatically generated and updated to that particular customer’s data over HubSpot. The administrator can specify the coupon code full of custom words or terms. For differentiating between the coupon codes, the add-on automatically uses the customer’s store id as a suffix in the code. Select the coupon type as like Percentage/Fixed Cart/Fixed Product as you want to provide the customer. Set to allow free shipping for this offered coupon. Last but an important set of the rule. Set the days for coupon expiry and it will be reflected in the customer’s data on HubSpot. 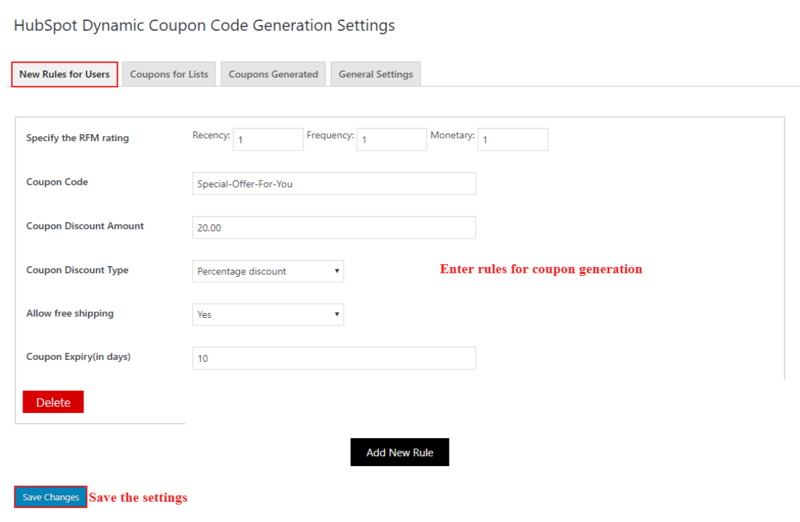 In the same manner, the administrator can add multiple rules for coupon code generation. Now, click on “Save Change” button to save your settings. Click on the Add New Rules for assigning coupons for the selected List. The admin can directly upload the desired and selected woocommerce coupon data to selected HubSpot Lists. Through this all contacts in the selected list will get the same coupon code and the previous coupon data will be over-written. By clicking on ‘Coupons Generated tab’, the administrator can get the list of all the coupons which are generated by this extension. You can directly update or Change your license key by clicking on “Click Here“. By clicking on the “Create Now“you can create coupon properties on directly on HubSpot.